Swatch Sunday is here again! Today I got to use a new-to-me brand, as well as a recent purchase. 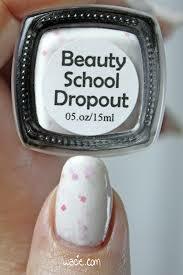 This is Beauty School Dropout from Dollish Polish, which was part of last month’s Grease-themed Beauty Quartet Box. It’s rare that I use a polish so soon after I get it, so this is super fun for me. I’m wearing Beauty School Dropout at three coats with one coat of Seche Vite top coat. Beauty School Dropout is a white crelly with glitters in various shapes and shades of pink, holographic silver, and white, as well as a fine pink shimmer throughout. The application process was pretty simple; the crelly goes on thin and translucent on the first coat, as crellies tend to do, then opacity increases with additional coats. It’s pretty typical in that regard. What I found unusual was how few glitters I got on each coat; there doesn’t seem to be much glitter in this polish. Drying times were good, and the polish dries with a semi-gloss finish. I added top coat for shine and protection. I love white crelly polishes. It’s been a long time since I’ve had the chance to wear one. 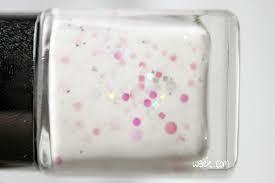 This polish has a lot of things I love: the crisp white, the pink glitters, the occasional glint of holographic silver. I only wish there was more glitter. These are things I can never have enough of. It’s a little refreshing to see a crelly that’s not overwhelmed by glitter, but I kind of wish this one was. That’s my only complaint, though; that side, I like this polish quite a bit. Beauty School Dropout was a Beauty Quartet Box exclusive and is no longer available as part of the set. You may be able to find one from blogger sales or destashes. 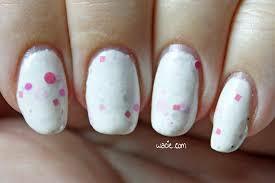 Other Dollish Polishes are available from their website.